While one of the consensus expectations resulting from last night's midterm election result is that any hopes for future fiscal stimulus have been put on hold indefinitely, thereby preventing any potential further overheating of the economy and obviating a need for further tightening by the Fed, this has yet to trickle down to the market, where this morning December rate hike odds rose notably, hitting 78% from just above 74% before the election. And while 10Y yields have dropped from yesterday's highs just shy of new 7 year highs, when the benchmark US Treasury hit 3.25%, dropping to 3.19% on Wednesday morning, the short end has been following rate hike intentions, with the 2Y higher modestly, rising to 2.932%, up 0.4bps. Also tracking the move higher in rate hike odds was USD three-month Libor, which was fixed higher by about 1bp on Wednesday to 2.6011%, the highest level since November 2008. While Libor is being phased out, it remains a key benchmark for over $200 trillion in financial securities which reference the infamous rate. Furthermore, even assuming Libor is fully phased out on schedule, and replaced with the alternative SOFR rates some time in 2021, an estimated $36T notional of LIBOR-linked instruments will remain outstanding after that date. In the meantime, many new trades continue to reference LIBOR and according to the TBAC, "the calculation does not consider replacement risk." More concerning is that as the Treasury noted in its latest refunding documents, LIBOR transition plans have not meaningfully altered issuance behavior as many deals continue to reference LIBOR. 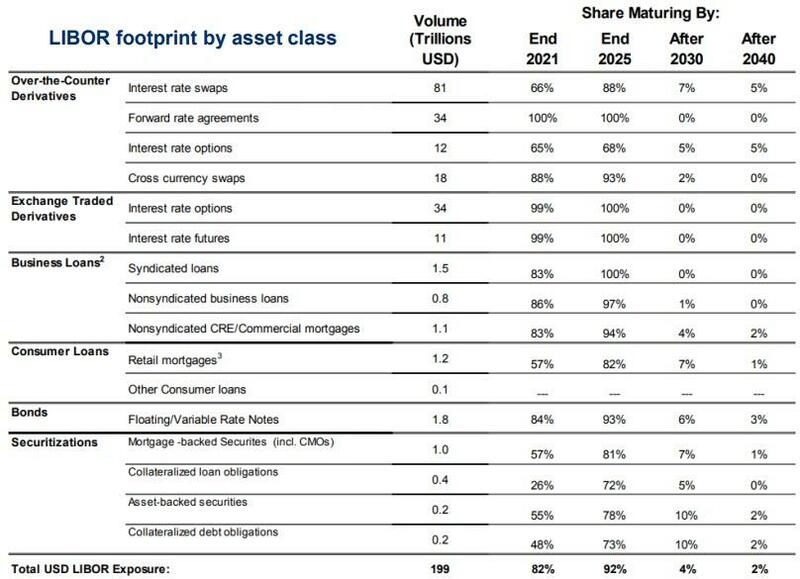 And the reason why rising Libor remains a major risk to financial conditions, is because as the table below shows, its footprint can be found everywhere, from OTC interest rate swaps, to leveraged loans - considered by many as the locus of the next credit crisis - to retail mortgages, to complex securitizations. While so far Libor's rise has not been cited as a key catalyst for tighter financial conditions, it is only a matter of time before the breaking point is hit, and the Fed is forced to end the tightening cycle, an event which will surely happen long before 2021 when Libor is no longer the dominant fixed income reference rate. There is much more on the role of Libor, and its replacement SOFR, in the following TBAC document submitted as part of the latest refunding announcement.